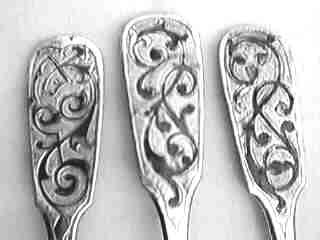 The set of 8 teaspoons pictured on this page were produced in 1859-1860 in the new Art Nuevo style. (Some have 1859 dates and some have 1860 dates). They all show graceful flowing loops and curves and a few show rectangles which is unusual for art nuevo. 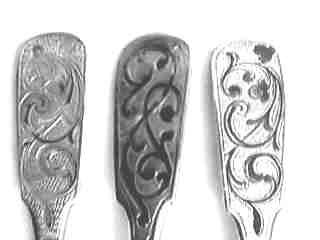 Each piece is different and the eight spoons were made by several different silversmiths probably under a master's control. 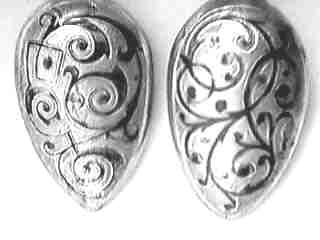 Niello is a very ancient technique of decorating silver. 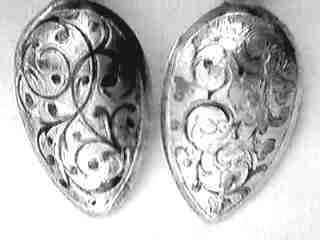 Except for a variation which is currently used on silver from Thailand (Siam), it has not been used in well over 100 years. 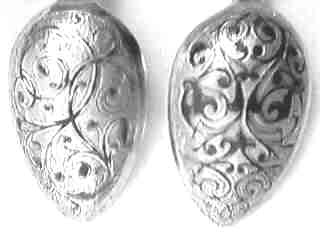 Russia during the 19th century was a very rich and prosperous nation and the nobility placed great emphasis on artistry of all types and this included silversmithing. Many fantastic articles of silver have been produced by the Russian silver masters and their mastery of enameling, and cloissonne techniques was so sophisticated that it still sets the world standard. Today, most of the remains of this unbelievably beautiful artistry resides in museums and even the smaller articles are usually sold only in the top auction houses for large sums. After the turn of the 20th century, Russian silver arts started to decline and the Revolution in 1917 terminated this work. Niello is related to these other techniques, but it was never as popular and consequently not as much was produced. Even to my mind it is not as pretty, but knowledge of the difficulty of the process, encourages me to buy it when affordable. The handles have niello on the front and back, but the bowls only have the designs on the back. The spoons are first hand pounded, thus each is a little different. 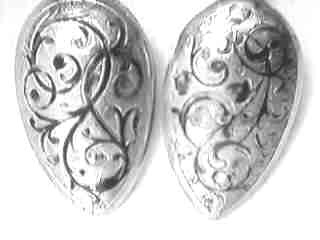 Then the designs are "gouged out" of the silver. The niello mixture of pure silver, copper, and lead in a ratio of 1:2:3 is created. Sulfur causes the new metal to become a grainy black and it is crushed into powder form. 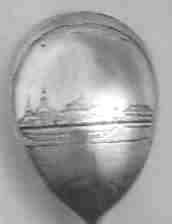 The powder is then applied to the grooves in the silver spoon and the spoon is reheated until the niello melts and permanently attaches to the silver spoon. The piece is then carefully cleaned and any unwanted niello is removed. This is a much more demanding task than this brief description indicates, and it requires a skilled artisan to achieve the proper results. 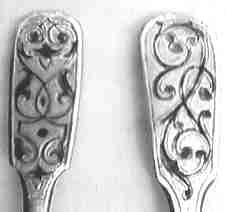 The bowls on these spoons have also been gilded with gold. The piece below was produced in 1871 and features a round handle with niello work and the back of the bowl is engraved with a castle scene. This Russian soup spoon is probably much later in the Art Nuevo era (I would guess 1890's). It features niello between the design elements and also has limited engraving. Note: One should never eat off the spoons which have niello work on the bowl. The lead in the mixture could enter the brain through the bloodstream and could cause damage. Of course, brain damage from lead poisoning was not known at that time.